- Encourage banks to use "covered bonds" to fund – and hold onto – the fixed-rate mortgages they originate. Widely used in Europe, covered bonds have longer maturities than bank deposits and are on-balance-sheet liabilities. For example, a bank might sell $2 billion of five- and 10-year covered bonds secured at all times by $2.1 billion of high-quality mortgages and other assets. Those longer maturities would reduce maturity mismatching, which was the underlying cause of the U.S. S&L fiasco and more recent problems in the financial markets. The FDIC has begun to look more favorably upon covered bonds, but far too cautiously. - Eliminate the double taxation of corporate dividends. This raises the cost of equity capital relative to debt, encouraging financial institutions to use excessive leverage to offset the high cost of equity capital. It also tilts banks toward securitizing assets into trusts not subject to the corporate income tax. 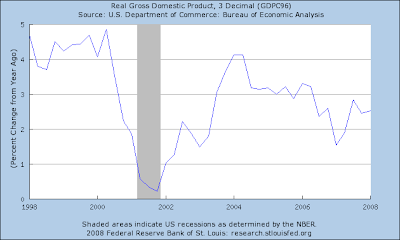 With revised GDP data released today, I thought it might be worth taking another look at recent history. 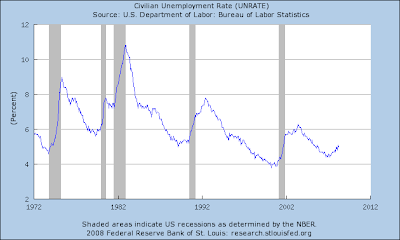 Click on the graph to enlarge. Here is an intriguing graph I ran across recently. 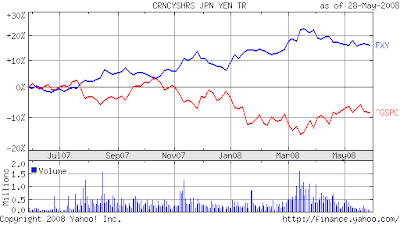 The blue line is FXY, an exchange-traded fund that tracks the yen. The red line is the S&P 500 index. Over the past year, the two time-series look like mirror images of each other. That is, holding yen seems to hedge U.S. stock-market risk. Why the striking pattern in the last year? I think it's because during the liquidity crisis, the stock market has fallen at times when hedge funds and investment banks are deleveraging -- at such times, they cover the carry trade, that is, they buy yen and sell high-interest currencies such as the Australian dollar. That story is consistent with the increasing risk of the carry trade. Vanderbilt's Robert Driskill takes free-trade supporters to task. The article is thought provoking, even if I end up unconvinced. What if free trade is making a small percentage of the country much better off, but is hurting a much greater percentage (the “Joe Sixpacks”), as some argue is the case? Even if the total gains to the few winners are sufficiently large that they could hypothetically compensate the losers, why would it be obvious that “Americans as a group are net winners”? I agree with Professor Driskill about one thing: Any normative statement goes beyond sheer economics and involves a degree of political philosophy. Economists' devotion to free trade is based not only on the positive conclusion that it leads to a bigger economic pie but also on a couple of related philosophical positions. Some economists take the libertarian view that people should presumptively be allowed to engage in mutually advantageous trades, absent any externalities. Under this view, the restricted-trade equilibrium has no claim to moral superiority--indeed, just the opposite. The fact that some people lose when trade is opened up compared to a restricted-trade status quo is of little moral relevance. Other economists take the utilitarian view that we should use society's resources to maximize total utility of everyone. Because of diminishing marginal utility, income redistribution from the rich to the poor is a key part of the utilitarian's plan. But a progressive tax and transfer system, rather than restricting international trade, is the most effective way of achieving that goal. Once again, the economic gain or loss compared to the restricted-trade equilibrium is no special relevance. Maybe it would be relevant if for some reason a progressive tax/transfer system were infeasible, but that is not at all the case. Note that the arguments that Professor Driskill uses would also suggest that we economists should not be so hard on the Luddites. After all, there are sometimes losers from technological progress. And the original Luddites were precisely such losers. Yet I doubt that one would find many thoughtful libertarians or utilitarians (or economists of any other stripe) siding with the Luddite cause. Amartya is no fan of ethanol. This is what the Great Society program did in the 1960s, with imports of doctors whose visas tied them, for specific periods, to serving remote, rural areas. U.S.-trained physicians practicing for a specified period in an "underserved" area were not required to return home. It is time to expand such programs – for instance, by making physicians trained at accredited foreign institutions eligible for such entry into the U.S. But in order to do this, both Democratic candidates will first need to abandon their party's antipathy to foreign trade. Alice Rivlin and Michael O'Hanlon pine for Ross Perot. Cornell's Robert Frank confirms his membership in the Pigou Club. the surprising thing in Robert Frank's book review in today's NY Times is that he endorsed the 2003 tax cut....he wants a progressive income tax and to exempt saving from taxation. So he's even to the right of the administration -- he would have a zero tax rate on dividends and capital gains. Note that my friend is distinguishing the 2001 tax bill from the 2003 tax bill. The 2001 tax bill was mainly about lower income tax rates and an increased child credit. The 2003 tax bill, in addition to accelerating the phase-in of the 2001 changes, was mainly about reducing the tax burden on capital. The New Yorker's James Surowiecki looks at the current debate over trade policy. The graphic to the right is a good summary of the article..
At another point, Ms. Waters [Democratic Congresswoman from California] brazenly suggested that perhaps the American oil industry should be nationalized, acknowledging that it was an “extreme step” but one that might be necessary if outsize profits and exorbitant gasoline prices continued. ...to my younger son Peter, who is in the third grade: The Number Devil: A Mathematical Adventure. Highly recommended for nerdy dads (and moms) out there. Barack Obama, the presidential candidate of "change," told a town hall meeting recently that he'd "seriously consider" eliminating the penny if Lincoln's face could be placed on another coin. The world has changed because of a few snap decisions made one weekend in March. We do not yet have an adequate understanding of what happened and why. But we can be sure that the Fed's action will be used to argue for more spending and more regulation. That's the number of visits this blog has had since it started up a little more than two years ago. Thank you all for coming. High gas prices have driven a Warren County farmer and his sons to hitch a tractor rake to a pair of mules to gather hay from their fields. T.R. Raymond bought Dolly and Molly at the Dixon mule sale last year. Son Danny Raymond trained them and also modified the tractor rake so the mules could pull it. Thanks for Frank Stephensen for the pointer. Here is the previous installment in this series. A generally sensible portfolio, but with two surprising omissions: inflation-indexed bonds and real estate. David Brooks channels economist Mancur Olson. By effectively killing "fast track" procedures that guarantee a yes-or-no vote on trade agreements within 90 days, lawmakers in Washington, led by House Speaker Nancy Pelosi, have destroyed the credibility of the U.S. as a reliable negotiating partner. With no economic feedbacks taken into account and under an assumption that raising marginal tax rates was the only mechanism used to balance the budget, tax rates would have to more than double. The tax rate for the lowest tax bracket would have to be increased from 10 percent to 25 percent; the tax rate on incomes in the current 25 percent bracket would have to be increased to 63 percent; and the tax rate of the highest bracket would have to be raised from 35 percent to 88 percent. The top corporate income tax rate would also increase from 35 percent to 88 percent. Such tax rates would significantly reduce economic activity and would create serious problems with tax avoidance and tax evasion. A talk with the distinguished economist and historian of monetary policy. So, you want things to be fair? In an age when we don’t need to have lots of children to work the fields, or to compensate for high infant mortality, Sachs argues that it’s both economically rational — and crucial for a future of sustainable growth — for people to reproduce at a rate close to 2.1 children per family. In his acknowledgments, Sachs thanks his three children. I also have three kids, but I don't feel a shred of guilt about it, for reasons I explained here. Speaking to a crowd of farmers in a barn, Barack Obama cited the Japanese not selling American beef as an example of how current trade policies have hurt rural communities. “You can’t get American beef into Japan…even though we have the highest safety standards. They don’t want the competition,” he said in response to a question about trade and manufacturing jobs moving to China. But Japan lifted its ban on American beef almost a year ago in June. The country had banned imports in 2003 after an outbreak of mad-cow disease. According to the U.S. Meat Export Federation in Denver, the U.S. currently exports over 5,000 tons of beef per month to Japan, down from 20,000 tones before the 2003 ban when Japan was the No. 1 importer of American beef. But the problem is not, as Obama said, that the Japanese refuse to import American beef. Rather, it is that American beef now faces stiffer competition with Australian beef, which is cheaper and has made major inroads in the market in recent years. Yet there are telling examples of the path we have taken from key economies around the world. For instance, when the USA economy was recently confronted by the devastating effects of Hurricanes Katrina and Rita, as well as the Iraq war, their Central Bank stepped in and injected life-boat schemes in the form of billions of dollars that were printed and pumped into the American economy. A few months ago, the USA economy confronted a severe mortgage crisis, which threatened to spark an economy-wide recession. This is from the Reserve Bank of Zimbabwe, where inflation is now running at an annual rate of about 355,000 percent. Like a lot of small-scale entrepreneurs, Cathy Osborne worries that she'll go out of business if fuel prices rise above $4 a gallon. Not because she won't be able to buy gas at that price, but because she won't be able to sell it. The old mechanical gas pumps with scrolling dials at her country store in Fauquier County lack the gears to go beyond $3.99 a gallon...."I don't know what I'm going to do. I don't have $30,000 to invest in new pumps." Obama supports the farm bill. Clinton scolds McCain for opposing it. Score one for McCain (for reasons spelled out in a previous post). Update: The liberal editorialists at the NY Times call the bill "disgraceful." The conservative editorialists at the Wall Street Journal concur. Ultimately, the issues involving ec 10 and Gen Ed are for the university and economics department. I just happen to be the current instructor running the course, so my personal opinion should not be given undue weight. Ec 10 has a long, distinguished history that predates me and will continue long after I retire. I have, however, been consulting with the chairman (Jim Stock) and director of undergraduate studies (Jeff Miron) on the issue. I did not particularly like the new Gen Ed requirements when they were first passed, and based on what I have seen to date, my opinion of them has not improved. I continue to believe that a simpler, more conventional set of distribution requirements would better serve the students. The committee that drafted the new Gen Ed rules tried to produce something more innovative than the kind of distribution requirements that other schools have. In the end, the process generated a product that was innovative but inferior. Unfortunately, it looks like we have little choice now but to live with it. One problem is that the drafters seemed to have inadequate appreciation of the role of analytic social science. The debate over where ec 10 fits in the new requirements is a symptom of these flaws. The Gen Ed committee appears to think that ec 10 should fit into "Empirical and Mathematical Reasoning." I believe, however, that this placement would be a mistake. The theories developed in ec 10 are extraordinarily basic. No math is used beyond what a typical Harvard student would have learned in the 8th or 9th grade. (This makes Ec 10 differ from the intermediate-level theory courses in microeconomics and macroeconomics, which use substantially more mathematics and are more oriented to developing tools for economics majors.) It would be a mistake to consider Ec 10 a good substitute for a course in mathematics or statistics. The better placement for the course would be "The United States in the World." This category is supposed to include courses that "examine American social, political, legal, cultural, and/or economic institutions, practices, and behavior, from contemporary, historical, and/or analytical perspectives." Ec 10 develops primarily an "analytical" perspective on "American...economic institutions, practices, and behavior," while also including discussion of historical episodes and contemporary policy debates. Does it matter a lot for ec 10 whether it is part of Gen Ed and, if so, where? Probably not. Harvard students are a smart lot. Many of them come in with a sense that they should learn some basic economics. They read the news. Their parents and older classmates alert them to the importance of the field. I have no doubt that whatever the Gen Ed committee ends up doing, ec 10 will remain a large, vibrant course. Joe says it's a failure. If you want cheering crowds, don't bother to study economics. It will only hold you back. Tell people what they want to hear-- and they don't want to hear about supply and demand. No, supply and demand is not too "complex." It is just not very emotionally satisfying. Any cap-and-trade system for carbon creates a valuable resource: the right to produce carbon. A key question in the design of the system is how those carbon allowances are allocated. Are they given out for free to power companies and other established carbon emitters? Or are they sold at auction so the revenue can be used to reduce government debt, fund public programs, or reduce distortionary taxation? If the allowances are sold, their price resembles a Pigovian tax, which readers of this blog will recognize as the optimal policy response. Over time, an increasing fraction of permits for emissions could be supplied by auction, yielding federal revenues that can be put to good use. Not bad, but the statement raises several questions. Why over time? Why not immediately? And how high would that fraction become? I think cap-and-trade system makes more sense. That's why I proposed it because you can be very specific in terms of how we're going to reduce the greenhouse gases by a particular level. Now what you have to do is you have to combine it with a hundred percent auction. The Pigou Club gives the edge to Obama. In response to the proposal in Massachusetts to tax Harvard's endowment by $840 million a year, one of my esteemed colleagues has an idea that he thinks would be better than my proposed move: Harvard can decide to no longer accept the children of Massachusetts residents. Faculty children excepted, of course. According to a recent survey, a majority of Russians believes that acquiring wealth requires criminal activity and political connections. Only 20% believe that talent matters. Gas Prices Send Surge of Riders to Mass Transit (as well as to smaller cars and camels). Time for Harvard to Move? Massachusetts legislators, demonstrating a growing resentment against the wealth of elite universities in tight economic times, are studying a plan to levy a 2.5% annual tax on the portion of college endowments that exceed $1 billion. Supporters said the proposal would raise $1.4 billion a year. Based on the most recent size of Harvard's endowment, the university would have to shell out more than $840 million annually. 2. Transfer much of the endowment to Harvard South. Support Harvard North by slowly selling off land in Massachusetts. 3. Eventually, make Harvard South the main campus, and Harvard North the satellite. If Massachusetts state lawmakers remain hostile, close Harvard North down entirely. I have often wondered what the efficient scale of a university is and, in particular, whether it would be better to create a second Harvard with the university's wealth than to expand the first one. Maybe the Massachusetts state legislature will give the powers-that-be at Harvard an incentive to consider more radical expansion plans. Caplan says: If they don't do this, they'll do something even worse. Rather than trying to prop up the corporate income tax against competitive pressures, countries around the world should celebrate its decline and work for its demise. From today's Wall Street Journal, in an article that gives the club some much-appreciated publicity. "All in all, I learned a lot from the book, without ever once feeling preached at." Paul Krugman thinks all of the fuss about the gas tax holiday has become a bit hysterical. He agrees that the policy is a bad idea, but it is no big deal, so let's not focus on it. Paul is right that the issue is, quantitatively, small potatoes, but I am nonetheless pleased to see it get so much attention. This issue is like the canary in the coal mine: No one really cares about the canary, but its condition tells us about deeper problems that lie below. Many economic issues (e.g., health care, corporate taxation, the trade deficit) are vastly complicated, with experts holding a variety of opinions. When candidates disagree, it simply means that each is siding with a different set of experts, and it is hard for laymen to figure out which set of experts is right. By contrast, the gas tax holiday is not nearly as complicated, and the experts speak with one voice. Ignorance: They don't know that the consensus of experts is opposed. Hubris: They know the experts are opposed, but they think they know better. Mendacity with a dash of condescension: They know the experts are opposed, and they secretly agree, but they think they can win some votes by pulling the wool over the eyes of an ill-informed electorate. So which of these three hypotheses is right? I don't know, but whichever it is, it says a lot about the character of the candidates. John McCain, the presumptive Republican presidential nominee who should know better, was the first presidential candidate to endorse the gas-tax holiday for the summer driving season. Reportedly, the idea originated with a political pollster, not among Mr. McCain's economic advisers. the US should take the lead in promoting global co-operation in the international tax arena. There has been a race to the bottom in the taxation of corporate income as nations lower their rates to entice business to issue more debt and invest in their jurisdictions. Closely related is the problem of tax havens that seek to lure wealthy citizens with promises that they can avoid paying taxes altogether on large parts of their fortunes. It might be inevitable that globalisation leads to some increases in inequality; it is not necessary that it also compromise the possibility of progressive taxation. This issue goes well beyond economics to questions of political economy and political philosophy. If you think it is the job of government to take from Peter to pay Paul, and if Peter can move around the globe, then you need international tax cooperation. Otherwise, some countries will become nations of Peters, leaving all the Pauls to fend for themselves. On the other hand, if you think that the main job of government is to facilitate voluntary exchange by protecting property rights, rather than re-slicing the economic pie as it sees fit, then tax competition is a good check against excessive interventionism. In other words, are you more worried about too little government or too much? It will, for example, substantially reduce the profitability of investment houses and, therefore, reduce their scale. But that’s the price you pay for access to a publicly financed safety net. That is why some economists cringe when Wall Street firms are bailed out. 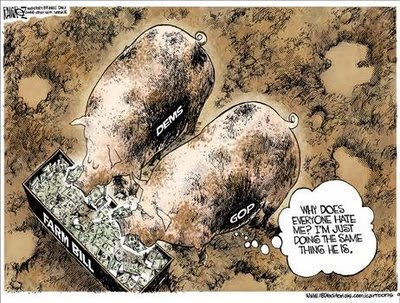 Beyond the obvious equity issues about risking taxpayer money to help rich guys, there is the problem of efficiency. If you start bailing the firms out when they lose, you have to regulate the gambles they take. You can no longer count on the creditors to limit the firms' leverage, as the creditors are counting on Uncle Sam if things go wrong. But the more regulated these firms are, the lower their productivity will be. The bottom line: The Bear Stearns bailout may have saved the economy from an episode of financial contagion in the short run, but in the long run it will likely leave us with a more regulated and less vibrant financial system. Farmers in the Indian state of Rajasthan are rediscovering the humble camel. As the cost of running gas-guzzling tractors soars, even-toed ungulates are making a comeback, raising hopes that a fall in the population of the desert state’s signature animal can be reversed. As Gas Costs Soar, Buyers Are Flocking to Small Cars.